Today’s organizations are faced with both increased competition and a dramatic change in the expectations of their customers and employees. The ability to meet these challenges requires responsiveness, a willingness to change, and accountability at every level in the organization. To help your people become the real competitive difference, conducting a 360 degree feedback can be your best catalyst for authentic change. 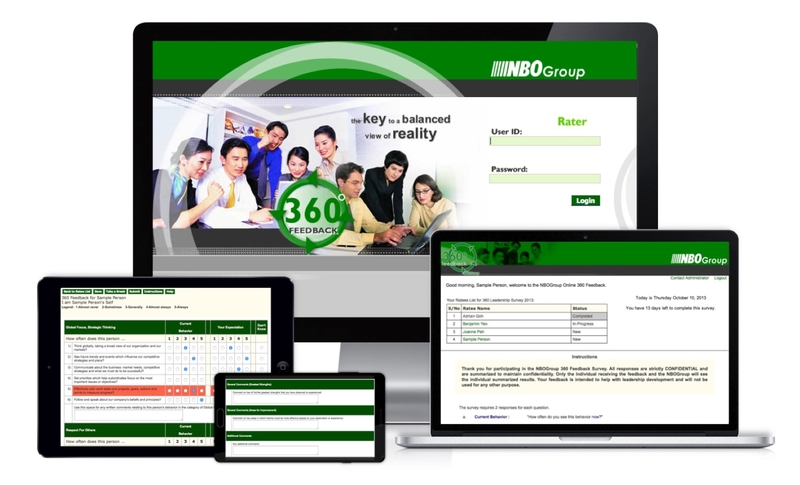 Developed for the Asian culture, where culturally, employees are less comfortable giving feedback openly, particularly to their bosses, the NBOGroup 360 Feedback tool is an online multi-rater feedback system that allows employees to give feedback on their colleagues and bosses in a confidential and non-threatening way. With the dual scale frequency gap methodology, raters are able to give honest feedback objectively and constructively. Participants are also able to receive the feedback with a positive attitude that motivates them to act on their personal development plans. One key reason why many 360 degree feedback initiatives fail to generate ROI is the low response rates, because most raters are not comfortable giving open feedback to their colleagues and bosses, particularly in the Asian culture. This is why we always recommend the 360 degree feedback to be used as a development tool, and that individual responses are confidential and anonymous. As a result, on average, our surveys close at 94% completion rate! A high participation rate is also indicative of a positive organization culture, building that trust between the management leadership and staff. Our dual scale frequency gap methodology also gives raters the extra comfort to participate in the 360 degree feedback process. Raters give feedback based on their perception of "how much more or less" of a specific behavior they require from the individual, instead of making a judgement of "how good" or "how bad" that individual is performing. This objectivity gives both the ratees and raters confidence that the consolidated feedback will be constructive and unbiased. Due to the nature of the dual scale frequency gap analysis, coupled with positively-worded survey questions, the NBOGroup 360 Feedback tool works for organizations across different cultures. Raters are more willing to provide honest feedback, even on their bosses, without fear of jeopardizing anyone's careers. Ratees, too, do not feel threatened by the feedback they receive because they are not being judged as a person. Instead, the feedback focuses on where they can improve on to be a better manager. With over 90% of people in an organization committed to giving high quality feedback, ratees are more motivated to accept and change behaviors. It is also easier for ratees to understand the feedback and be able to take actions to make those behavioral changes. Compared to single scale surveys, where individuals only receive an absolute score on how they are currently doing, dual scale gap analysis provides that end goal that the individuals need to achieve. In our 20 years of experience, many participants (ratees) have found their NBOGroup 360 Feedback results to be "confirmative" and "helpful" in identifying areas for improvement. In dual scale gap analysis, feedback is more accurate because it is unbiased and having a high participation rate means that the feedback gathered gives a more holistic representation of the reality. "Very interesting and especially useful in our day to day work environment. I get to know myself better and understand how others perceived me. I also get to know my staff and boss better, and I hope this can help to enhance our working relationship." From identifying competencies and questions, to guiding your people on their own development plans — whether you prefer to outsource the entire 360 degree feedback process or manage your own — we can work with you to customize a 360 feedback project on a flexible range of project sizes and budgets. Quick and easy; Choose different components to create your preferred 360 degree feedback experience. Full 360 experience; We handle everything from briefings to survey administration & results workshops. "Very impressive on the way the course is organized and how personal profile is analyzed using 360 degree survey. Facilitators are experienced, clear in conveying messages and quote examples." Read how a Sembcorp senior executive used his 360 degree feedback results to achieve remarkable changes in only ten months' time. See how LTA successfully implemented 360 degree feedback for more than 300 employees across the entire organization. "Good value in the individual 360 report, especially the written comments." "All went smoothly, online survey was easy to use and the process is effective." "This is a very good survey to help individuals understand other's view."